I brought back several bottles of beer from my early December trip to Boston. Most of them are gone now except for the darker, less hop forward beers. 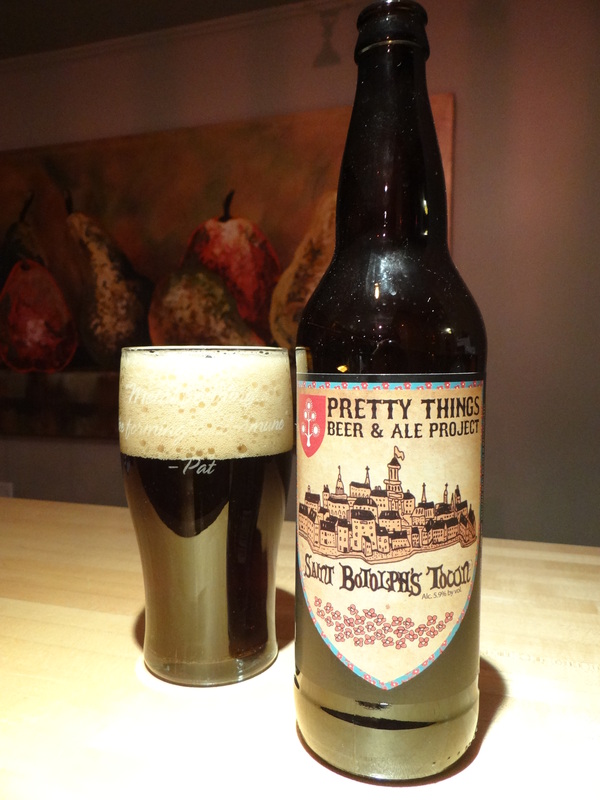 Tonight I’m reviewing Saint Botolph’s Town by Pretty Things Beer and Ale Project, based in Boston. Pretty Things is brewers Dan and Martha Paquette, who are tenant brewers, meaning that they rent space in other breweries to brew their beers (this approach is also called gypsy brewing, Mikkelar being perhaps the best known example). From what I’ve seen online people who know about beer seem to hold Pretty Things in high regard, so they were high on my list of beers to try while in Boston. As it turns out many of the beers I brought back from Boston did not live up to my expectations, but Saint Botolph’s Town did not disappoint. The color is a deep mahogany brown, with some ruby highlights when you hold it up to the light. It has a nice big (3-fingers) off-white head. The nose is very inviting, chocolate with definite nutty highlights, and the taste follows the nose pretty closely. I’m struck most by the distinct nutty flavors that nicely compliment the chocolate from the crystal malts (imported from Yorkshire). It finishes dry with very little bitterness. Despite the 38 IBU there is no discernable hop presence in the taste of this beer. The mouthfeel is not terribly thick but it is somewhat creamy. Overall I would say this is the epitome of what an English Nut Brown Ale should be. It is the best example of the style that I can remember drinking. I think that the distribution of Pretty Things beers is limited to the Northeast, but if you are in New England and you have a chance to try this beer don’t pass it by.